Conflict in romantic relationship is one of the most common reasons that people seek Couples Counseling or Marriage Counseling. Are you struggling to communicate or connect with your spouse or partner? Is it difficult to talk without arguing? Do you fight about parenting issues? Are you suffering after an affair? If the answer is yes to any of these questions, couples or marriage counseling is the first step toward positive change in your relationship. Couples Counseling is a type of therapy that helps to improve communication and connectedness in a romantic relationship. Counseling provides a calm and collaborative environment where each person can do their best thinking and also hear their spouse’s concerns and ideas. With practice and insight, a couple can be empowered to take these skills and apply them at home. 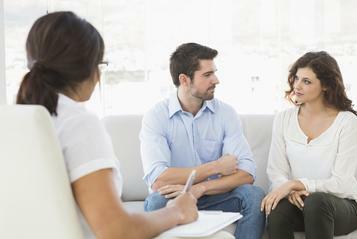 Couples or Marriage Counseling typically involves both partners, but sometimes one partner chooses to work with the therapist individually for a short period of time. There also does not have to be an active problem for you to benefit from couples counseling. Many people find that thinking out loud with a counselor before marriage, the birth of a child, or other life transitions can strengthen the relationship and improve collaborative problem-solving. What will we learn in Couples Counseling? At Midwest Center for Hope & Healing, our objective is to support you in having the fulfilling, passionate relationship you desire. Call us today to setup an appointment for couples counseling with one of our therapists.